As a teenager I used to admire her beauty and vitality. Time passed, I almost forgot about her. Then, she had to face her illness and the way she fought it, her humanity, fragility and sincerity made me fall in love with her again. That's why I took her example to remind me (us) that time flies, life is short and the best we do is enjoy each day (without betraying ourselves). This is my entry for this week Take a Word theme: Time. Farrah Fawcett photos and backgrounds were googled; clocks: Dover and Graphicsfairy. A gorgeous collage Chris I love the blue...a beautiful tribute to Ferra. 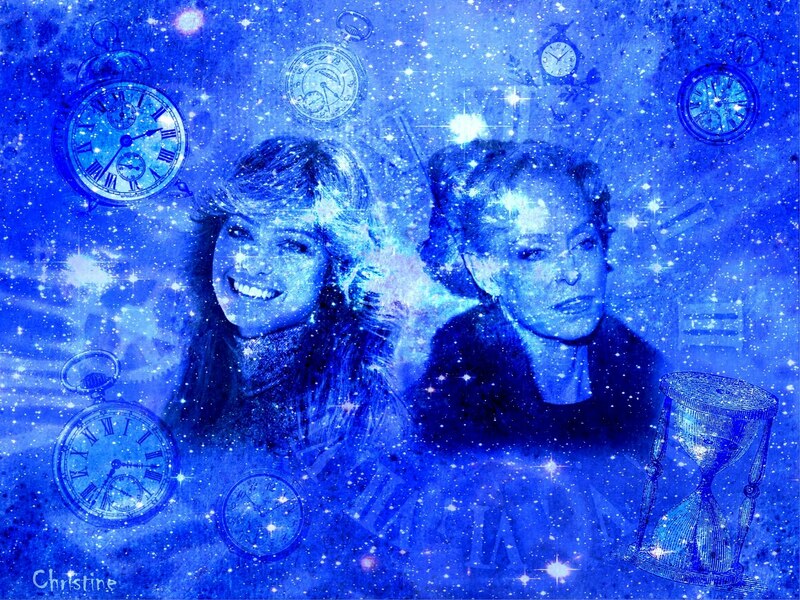 A very beautiful collage for blue time. A beautiful collage and tribute, Chris. beautiful piece and a lovely, touching tribute. A wonderful poignant tribute and timely reminder for each one of us to live every moment. Bravo, my friend. Great words to live by, Christine, and a lovely art piece. I have to tell you a story now ! When Farrah left charlie's angels, Cheryl Ladd took over her part. I'm sure you remember Christine. Well, The years passed and the series stopped but I always remembered that beautiful name Cheryl !! In 1986 I gave birth to my oldest one and named her....CHERYL !!! A name that was very unusual in our country and many family members didn't now how to speak (pronounce?) it. Thanks for your orginal and pretty entry ! At first, Farrah was known only by her "big hair" and her beauty but she proved later on that she was a great actress. It was so sad that she died a long a painful death - too young. This is a beautiful tribute to her Christine. Wonderful artwork. What a thoughtful post! It seems time is flying too fast for many of us.